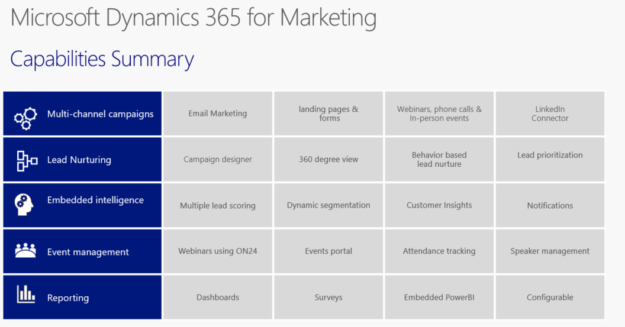 Microsoft Dynamics 365 for Marketing vs ClickDimensions, an initial comparison. Microsoft has released their Microsoft Dynamics 365 for Marketing module, this article is an initial review of the module and high-level comparison to ClickDimensions (the other mainstream marketing automation option for Dynamics 365). Availability - There are a few different subscription options for the Marketing module. Let's first compare the pricing models between Dynamics Marketing and ClickDimensions. Dynamics Marketing is priced based on the number of contacts. There has been a lot of um let's say feedback on this model. As a partner we work with many Dynamics 365 clients, we see even small businesses that have lots of leads/contacts in their Dynamics database. Often times there is a large number of leads/contacts that will never be marketed to, under Microsoft's pricing model you are paying for these leads/contacts even if you don't market to them. The upside to Microsoft's pricing is that there are no upcharges for functionality, you get all the goodies with any subscription level. 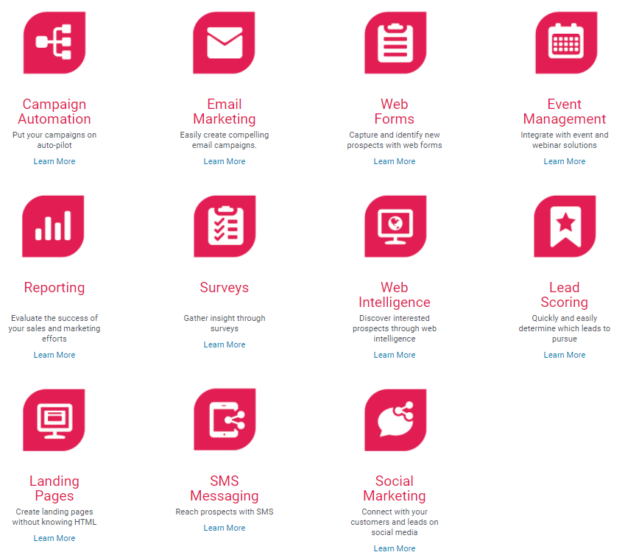 The Advanced/Business subscription level adds functionality - Automation, Landing Pages, Lead/Contact Scoring, Event Management, Surveys and Subscription Management. For a fair comparison with Dynamics Marketing you should use the ClickDimensions Advanced/Business subscription level. ClickDimensions also offers Social Engagement that is an add-on, $250/month for Basic and $600/month for Business. Microsoft includes their Social Engagement tool in the base price of Dynamics Marketing. The Social components of each solution are different so look at each closely to determine which solution meets your Social needs. Standalone - The Marketing module is offered as a standalone option. This is a differentiator, ClickDimensions is only available as an add-on to Dynamics 365. The standalone marketing module also includes Microsoft Social Engagement, Voice of the Customer for Microsoft Dynamics 365, 1 Portal, Non-Production/Production Instance, and Storage. Pricing is $1500 for the base package with 10,000 contacts. You can add more contacts for $250/month for 5000 contacts. "Attach" Plan - If you already have Dynamics 365 Customer Engagement plan licenses you can attach Dynamics Marketing to your subscription for $750/month, 2000 contacts included. Additional contacts cost $600 for 1st 8000, then $250 for each additional 5000. If you already have Dynamics 365 application licenses (like Sales Enterprise vs the full Customer Engagement Plan licensing) you can attach Marketing for $750/month, includes 10,000 contacts and $250/month for each additional 5000 contacts. 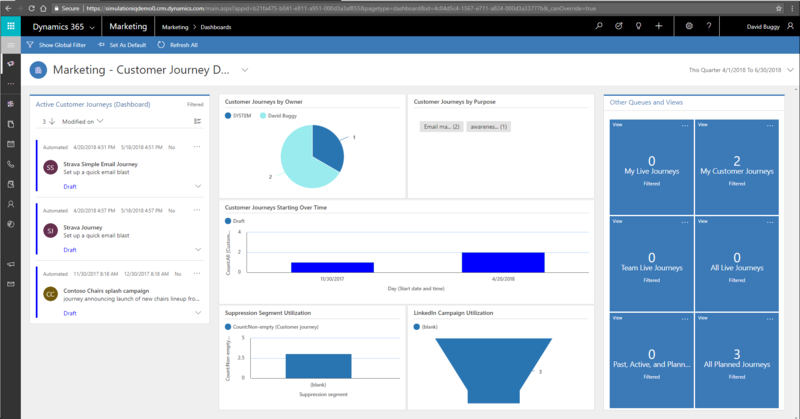 If you license the Marketing module standalone you get Microsoft Social Engagement, Voice of the Customer for Microsoft Dynamics 365, 1 Portal, Non-Production/Production Instance, and Storage. If you are a Customer Engagement Plan customer you get portals, Social Engagement with your Customer Engagement subscription. If you have the Sales app. licenses you don't get Social or Voice of the Customer, they can be added on to your subscription. Dynamics Marketing limits the number of emails you can send monthly, 10 times the number of contacts in your database each month. You can also have up to 100 active customer journeys. To truly compare pricing you will need to know the number of leads/contacts in your database and the number of emails you plan to send annually. Confused? We can help you determine the proper solution and subscription level. ClickDimensions leverages standard Dynamics 365 functionality (Marketing Lists for example). ClickDimensions looks and feels like any other area of Dynamics 365. Dynamics 365 Marketing is deployed in the new Unified Client (if you try to access the functionality via the standard browser interface you will be confused as all the functionality is not there(at least not that we could see). There is no clear instruction on this, to access the Marketing functionality log into your portal - login.microsoftonline.com, click on Dynamics 365, then find the tile for Marketing, this will get you to the unified client. I have used Microsoft CRM/Dynamics 365 for over 14 years, the Marketing module is different. Yes, it looks very new and fresh but that comes with a learning curve. When I first logged into the Marketing tool I could not easily perform simple tasks (like building a segment, more on that later). I had to revert to the documentation. You can build your query one of 3 ways, Designer (point and click), Flow or Query. I cannot understand why the standard entities like Marketing Lists and Advanced finds are not used. Now users need to learn multiple ways of querying. ALSO - I found the Marketing module not to work with Microsoft Edge.... I had to open it in Google Chrome. You cannot just pull together a list and send an email, you must build a Journey even for one-off emails. The Journey functionality is nice and I think will ultimately prove to be a good tool. ClickDimensions has very similar functionality in their campaign automation (very similar UI for building Journeys/campaign automation). Pages, Forms and Websites are pretty nice in Dynamics 365 Marketing. Very visual and drag/drop based editing. LinkedIn lead generation is also built-in allowing you to create forms on LinkedIn to collect leads. There are some advantages in these areas over ClickDimensions in our opinion. Reporting in Dynamics Marketing is good with some builtin dashboards. There is a PowerBI content pack also available however we could not get it to connect to our Dynamics Marketing instance. ClickDimensions also has builtin dashboards available as well as a PowerBI content pack, builtin views. All-in-all we are impressed with the Microsoft Marketing offering, especially for a V1 release. I like that it is available as a standalone application for businesses that are not ready for full CRM or just need a marketing application. I am not thrilled about the pricing model (based on leads/contacts), that will limit sales in a lot of accounts who are smaller but with large databases. I admit I am biased having used ClickDimensions for a lot of years. I try not to let that sway my opinions. I am a Microsoft and Dynamics 365 evangelist, I love what Microsoft is doing with the Dynamics 365 platform but our job and first loyalty is to our clients and to help guide them to the best solution for their needs/requirements. From where I sit today we will need to spend more time with the new Marketing module and will be writing additional reviews on the solution. Find and nurture more sales-ready leads with Microsoft Dynamics 365 for Marketing. Get dynamic marketing transformation for growing businesses. Choose the right Microsoft Dynamics Partner for your business by doing some research online. I checked with ClickDimensions, the additional 100K emails add is $1200, not $100. It is always x 12 months for the $100/month price list. Nice article, Dave! Does the query functionality have any different capabilities than advanced find (e.g. does it support FetchXML)? Thank you Susan! The new query tool is only for building marketing segments, I find it much less useful than Advanced Find overall.